Stangenes Industries, Inc. produces Isolation Transformers, Current Monitors, Charging Inductors, and many other magnetic components designed and manufactured to customer specifications. Especially, High Power Klystron Pulse Transformer is used in the doubling project (SLED) at Stanford Linear Accelerator Center (SLAC). 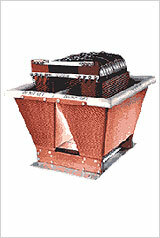 The unit is rated at 270 Kilovolts, 75 megawatts, for a 7 microsecond pulse. All Transformers can be customized in shapes and sizes upon customer's request.